Do you know the feeling when you’ve just finished cleaning out the hallway closet? For me, that stack of old sweaters bound for the thrift shop is much more than a closet cleansing and it leaves me energized and feeling remarkably satisfied. I experience the same sensation at work when I hack through the items on my desk so that I can actually see the surface again. In some strange way, letting go builds confidence. Purging the old and unused to create a sleek, clean space causes me to sleep better and to be more efficient. And you know what? It’s not just those old ugly Christmas sweaters. It’s a great time of year to lighten up in many ways whether it’s the shedding of an unfitting relationship or the hairy tub of sour cream from the back of the fridge. Are the people with whom I’m engaged having fun and passionate about what they’re doing? In a similar manner, we can purge other areas by simply asking, “what do I need?” – which can apply to spending and eating. After a robust holiday filled with family and food, I find it a great time to focus on plant-based meals; green smoothies, spinach enchiladas, bok choy soup and this one. It not only uses up the final spaghetti squash of the season but also uses my (very-underutilized) microwave to get a meal on the table fast. 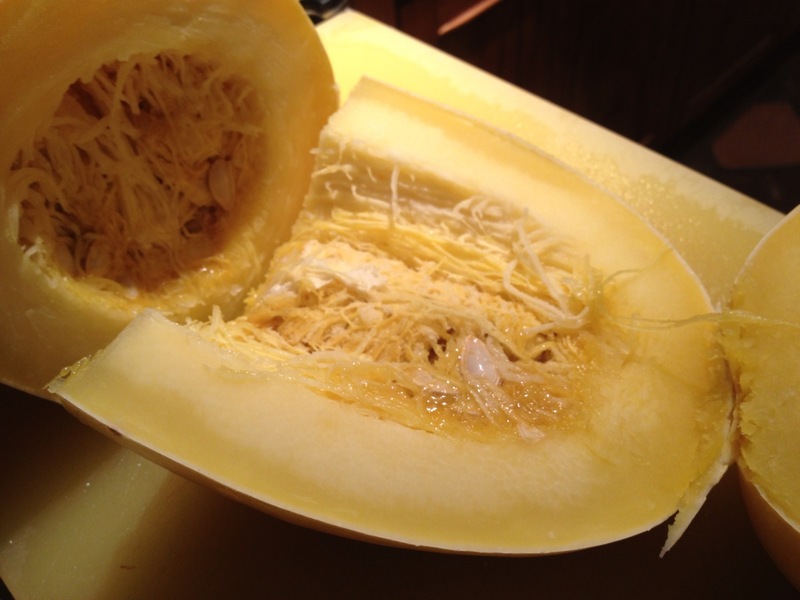 Pierce spaghetti squash all over with a small sharp knife to prevent bursting. Place in a microwave oven on and cook on high powerfor 6 to 7 minutes. Turn the squash over and microwave until squash feels slightly soft when pressed, 8 to 10 minutes more. Cool squash for 5 minutes. Meanwhile, melt butter in a small heavy saucepan over moderately high heat. Add garlic and cook, stirring, until golden. 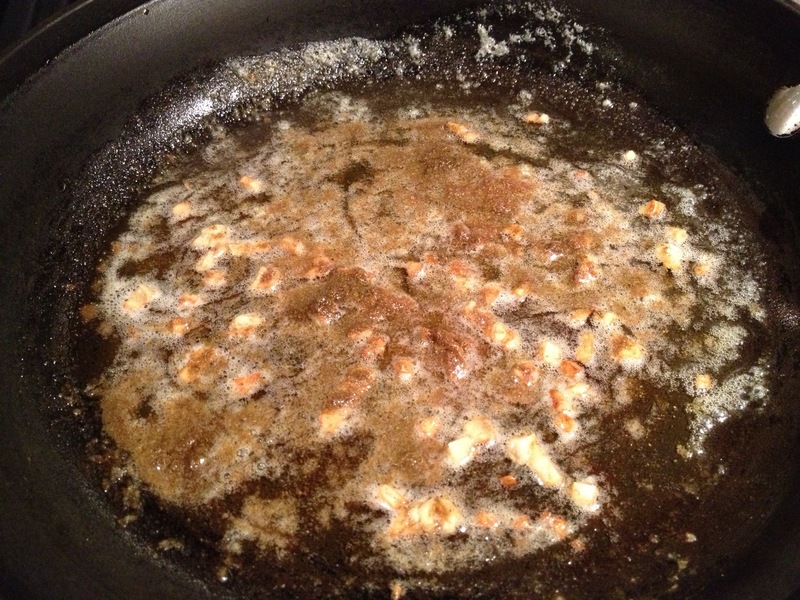 Stir in the remaining spices and salt and remove from heat. Carefully halve squash lengthwise and remove and discard seeds. Working over a bowl, scrape squash flesh with a fork, loosening and separating strands as you remove it from skin. Toss with spiced butter and cilantro. Sprinkle with pumpkin seeds. Where can you lighten up in 2013? 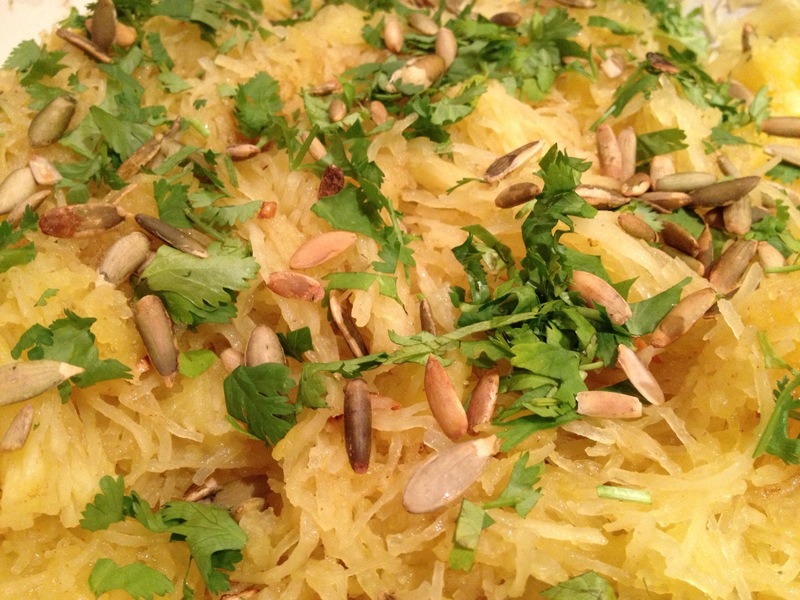 I have always wanted to try spaghetti squash. This recipe looks like it is going to be my breakthrough moment! Yum! You can do a lot with it. I really like it with pesto also. Can’t wait to try this recipe. Have my friends from London coming over on Sunday for dinner and this will be a fabulous side!!! Great post about “lightening up”! I try and do as much as time allows me to get that sort of stuff done! You may want to cook it a bit longer and add more stuff to it. Feta would be good too although not lighter. I’m eyeing some clutter right now that I need to get rid of! No time like the present! I dusted and cleaned half of the house two days ago just to feel like I achieved something. It worked! 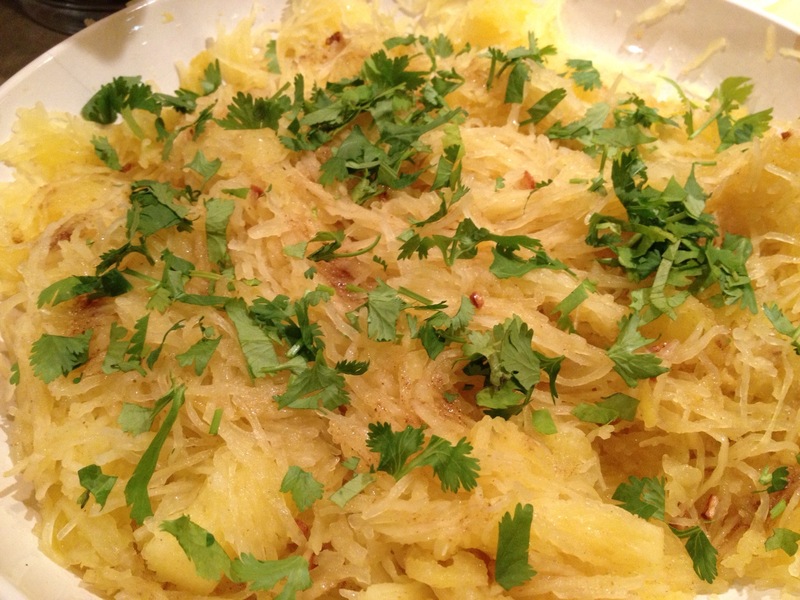 You know, I totally forgot about spaghetti squash this year. Looks tasty! And I like the way you think about your activities and friends–fun and passion is a good combination. Happy New Year! We having to create some filters or we will simply be overrun with great opportunities and never enjoy any of them as much as we should. This post came at a great time, as these are all ideas I’ve been working through this month, too. Your three questions are perfect for defining what’s important. Thanks! You can thank Deepak for those! Off to check out pinterest Jeanne! We need less. Tammy, I think the blog is called Happy Housewife, and there is a badge near the top of the page…Organize in 365…It covers everything! I may have to do further research on why the feeling is so rewarding – but it is. Wonderful , Tammy, the thought of lightening our loads . ..and the squash! 🙂 I have a LOT of lightening to do, but I’ve begun and will keep at it. My hubby even joined in .. .and he’s an avid ‘saver’ of stuff! 🙂 I just need to make decisions and not hesitate too long. Maybe you can come up with two or three guiding principles that lead you to make a faster decision. Do I need this? Is this sentimental in a way that I can’t get from anything else? If it was gone, would I truly miss it? Oh, great idea to help me through the decision process! Mostly .. ya, it needs to go! haha! So you spent time with Deepak Chopra ? I’m sure that was fascinating and enlightening! I went to Chicago for a few days in November and got to have a lot of good quality time with him. Fascinating time. It does all work together: the lightening up from stuff and food, both. It’s almost like we stray from all/most of our values (material, food, exercise, etc.) in December, and yearn to put it all together again in January, heading ourselves in a good direction. Redirection is a good thing. Yeah. That makes it perfect. I totally agree, Tammy. There’s a blogger called Paula who always ends her posts by wishing us ‘enough’. I think it is wisdom to know what that is. We always have a junk room that would benefit from some attention! That is one of my goals this year…lighten up…everywhere…great post! You bring up a very valuable point: discerning the difference between wants and needs. We tend to take for granted the luxuries that fill our lives, and our lifestyles reflect this. People in other parts of the world with fewer luxuries are often happier, healthier, and less prone to violence that we are… which means an exploration of the question you raise is very important. As you say, the answer is not one of minimalism, but rather of maximizing – our appreciation of the things that really, truly matter to us. stuff, possessions, greed, want, crime – a do see it as a continuum that is hard to fulfill. Great post Tammy and I agree with “KNOW THANK YOU” 100%. We are busy getting our bodies and health in great shape as well, cleaning out and sharing with people that need “it”. Feels good to clean the attic, so to speak. If we really got down to what we need, I think we’d amaze ourselves! Lovely to shed a lot of baggage, Tammy: we’re taking our whole house through a detox in April. Looking forward to it immensely. Love the idea of a whole house detox Kate! Yes, spring cleaning at its best. Yes, I hate it but I need to roll my wine consumption back now. I love this!!! I actually spent new years eve and new years day working on decluttering our everyday spaces. I still have a lot of work to do, but it felt soooo good to start the new year fresh. decluttering everyday space is great. I love the recipe and look forward to trying it. Thank you for posting a recipe that can be made in the microwave. For two months I have been working on decluttering our home… every single cabinet, closet, drawer, hook, nook and cranny. It has inspired my husband to tackle the garage. Working on what you need is tough, but refreshing as you get there. My kitchen has 41 places to put stuff, such as drawers, cabinets and doors. It was such a relief to get that puppy done. However, I likely have some hairy things in my fridge. Time to tackle that tomorrow! Everything but my daughter’s room has been lightened in my five bedroom three bathroom two story home…and windows were cleaned inside and out…..and boy does it feel good to be lighter. There’s room for more lightening up in some areas such as my closet – so that’s my goal for next weekend. And doesn’t that make you feel better Danielle? I love that you made part of losing 5 pounds what you cleared out in paper! Liberation from stuff – also old attitudes and anything else that has ceased to work or be relevant – does build confidence. Stepping out of the old and into the new is a powerful lesson in how we can keep going and keep growing. I love this post, Tammy. Happy new year to you and yours! I look forward to following your progress this year. I think if I took this on as a discipline, that I could find so many areas where a purge is needed. Hmmm. Might make an interesting project. I love this post on so many levels. Not only does the squash look delicious, but a reminder to lighten up our lives in always good. I’m in the process of trying to declutter – I don’t know how a small house got filled with so much stuff! And although I didn’t write it, lightening up on ourselves isn’t a bad idea either. More humor. More ability to laugh at ourselves. Hey, a few blogs ago you were covering the new chicken “farmers.” I bet someone did (maybe ten) mention there is a new book out called the “Chicken Chronicles” written by prolific and Pulitzer winner Alice Cooper of the Color Purple.” I am sure there is some practical info included but she called it a spiiritual journey. She raised them as a child. The people who read it liked it. I am still chickenless.., Paul Sorry if this is old news. Yes, that recipe is easy. If I do it again, I’ll cook it a bit longer and add a bit more stuff – maybe some feta. If you read your comment again, you will laugh. I love Alice Walker and would like to read Chicken Chronicles but Alice Cooper is a local guy with bad make up. Thanks for the tip Paul. This post totally hits my current mood – I’m in such a need to get rid of *stuff*, after being drowned in exams and not else for months, and left everything lying around and piling up otherwise. Two days ago, I went through my wardrobe and sorted out some clothes that don’t fit well anymore, and the kitchen will be next. 🙂 And also in other parts of my life I feel the wish to focus on what is essential. I love the new blog design! Very clear and clean, just like the message of your post. I think with all of your academic achievement, you could write a very nice post or instruction on how to do this in all the areas of our lives. Happy New Year Kath. Very happy for you. Ooh. I wish I’d seen this 2 days ago when I was trying to figure out what to do with my spaghetti squash! I ended up roasting it and putting parmesan on it. It was good but this looks wonderful! I have yet to roast one so we’ll have to trade recipes. I like it but I do get tired of them. What a great post. I love the questions, the recipe, and the overall upbeat tone. How perfect for the new year! Thanks Kirsten. If I did those things then I achieved the outcome I was hoping for. Happy New Year. Tammy, I love this post – the purging, the lightening, the New Year, and especially those three questions you ask as a “filter.” I have been saying for a long time that a job is not worth it if you don’t LIKE the people you work for/with and if you are not having FUN (at least some of the time!). A good filter for life and career choices. Yes, it’s helpful to me as I make choices about how to spend time – and although we do it every second, it’s a huge choice. I have been “on the purge” for a few months now, increments at a time, ridding our home (where we have lived for 13 years) of the unwanted. The basement, where the unseen has been stacked for eons, was the first place I attacked. I told Bill it held psychic weight–we had no idea how it was burdening us. Yes, that sensation of lightness is palpable! I like how you have broadened that concept to include how we spend our time. It is palpable Nancy and I have some more to do around here!